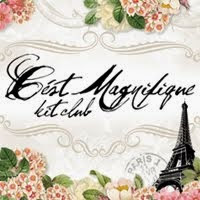 Hello dear C´est Magnifique friends, it´s Evelyn here! Today it´s time to host our second Mixed Media Challenge! How does it work and what are you asked to do? Every month we will ask you to use a Mixed Media Technique, special art supplies, ......... well, stay curious, what we will bring you in future! We will show you a Technique Tutorial so you can easily imitate on your project. And the best of all, it is an Anything Goes Challenge! That means you can create, whatever your heart desires - create a layout, canvas, card, altered project, OTP project, art journal page.......... whatever you want! Of course you can combine our challenges, you only have to follow the rules. ADD TEXTURE TO YOUR BACKGROUND IN 3 DIFFERENT WAYS! I´ve made a layout, where I show some variations of texture work for your background. I did some more background work, but I´m sure, you will have many more ideas and I´m looking forward to seeing your projects! So come and join in and first of all: Have fun! Here are the rules, they are simple and will make your project enjoyable to create! 1. The challenge runs from February 4, 2016 and ends March 6, 2016 at midnight. 2. Create a project adding texture three different ways. You can create a layout, altered project, canvas, cards or anything that inspires you using this technique. 3. When you are done, leave a comment on the C'est Magnifique Blog with a link to your blog sharing your C'est Magnifique background 3 ways Challenge projects. Please title the Blog Post as C'est Magnifique February Mixed Media Challenge. Hi! In the text it says the challenge is to add texturers in three different ways and in the rules it says to make something and use the stencil bump technic. Wich is the challenge? Hi, sorry, you are right, I missed to change the rules - it was very late when I posted it yesterday. The challenge is the one on top: add texture in three different ways! Sorry again! Hi there! Here's the link to my layout! You don't mention if it is ok to combine with other challenges - I think it used to be at least? Mine is DT work so I could not make the blog post titled C'est Magnifique. If this is not ok, sorry for the trouble and just count me out! Hi there! I can't find the results for this in your blog - is it really so that they're not out yet? Thank you!